great pictures, unique experience, beautiful product, great service. At any time. No questions asked. 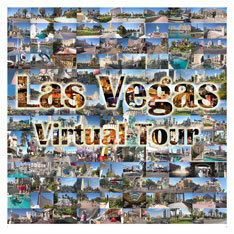 Las Vegas Virtual Tour: Las Vegas Boulevard. 650 high quality 1003x667 photographs. A version with smaller 752x500 pictures is included. Internet Explorer or Netscape Navigator. Java. Internet connection is not required. A real tour, not just a photo collection: turn right, turn left, go forward. Two tours: a day tour and a night tour. This is mercilessly true reflection of one of the most famous streets in the world. It is presented as it really is. It is not a movie or slide show: you are in control where you want to go and how much time you want to spend observing a photograph. Large pictures show you the life and beauty of this fabulous place in sharp details. The life of Las Vegas is concentrated inside the many Downtown Las Vegas Hotels and casinos, but the street provides you with a slice of people's characters, desert weather, blue sky, modern wonderland skyscraper silhouettes. It is a slice of the channels between many worlds of entertainment and gambling. And the people are those who carry the spirit of it. We never go inside of any building. Just walking outside is plenty to take the heart away. The pictures on the CD are large; The CD box is beautiful - an excellent souvenir. The tour is not bound - walk as long as you want. No download delay. Auto Mode is available. And you support my effort to make more virtual tours. As soon as you insert the CD-ROM into a computer, your Internet Browser will start, and you will be presented with a page the same as on my website which is essentially a miniature Las Vegas essay with pictures you can click on. You can also use the map of Las Vegas Boulevard with plenty of "entrances" into the virtual tour and thumbnail images for the day and night tours. Once you click on one of the thumbnail images or arrows the window is renewed to the virtual tour page and you appear in a particular place. The virtual tour runs as a Java applet. If you tried the tour here, on internet the CD will work for you either. Java is a part of most modern computer installations. One can always get Java here. The cursor changes when you move it around the picture. It shows you where you can go. Make your choice and click. It brings you to the next picture. At any time you can come back with the [Esc] key, or preview available directions with the [z] or [Ctrl] keys. This way you can turn left, right, go forward, look at items, even jump. Well, the way it is supposed to be in a virtual tour, isn't it? To rest from clicking, toggle the "auto mode" on with the [a] key and let the computer intelligently guide you around. It is more than a screen saver slide show. The computer wonders around the street. It chooses a new path and presents you with pictures you might miss. There are many crosspaths, the way is never the same. This is a new art form. Photographs are made and arranged in a tour by Igor Polk. The CD is cut in a studio, and all inserts are printed on a quality photo paper. Each CD is signed by the photographer. You can personalize it. Let me know what text you want to be printed or written and where. The CD is proudly made in USA, pictures were taken in June of 2006. - Please, consider your purchase as a contribution to research and continuing production of new virtual tours by San Francisco Click, the Virtual Tour Internet Magazine published by Yes San Francisco and Igor Polk. Copyright©2006 Yes San Francisco, LLC. All Rights Reserved.